In one word…AMAZING!! Slimmons Studio, one of LA’s best kept secrets, has actually been around since 1974 and has been going strong ever since!!! Tipping the scale at 268 pounds, Simmons decided it was time for him to get in shape and couldn’t find a gym that was right for him, so he decided to open his own! He has since written nine books, created over 50 workout videos and has helped overweight men and women lose over 3,000,000 pounds…he is a true inspiration. Simmons might be best known for his Sweatin’ to the Oldies workouts, short shorts and vivacious personality, but should really be seen as an inspiration to all of us as he proves that one person can make a difference in so many lives. This class is great for fitness fanatics of all levels, so long as you are prepared to twist and shout and throw caution to the wind as you follow Richard through a series of zany cardio dance moves. The opportunity to work out side by side with a fitness legend is something you just can’t pass up! Richard teaches every Tuesday, Thursday and Saturday that he is in town, and it only takes a simple call to the studio to make sure he’ll be there before you show up. We have participated in many different and unique workouts, but Slimmons has to be one of our favorites, and is certainly the most entertaining! A friend of ours told us about Slimmons a few months ago and we were able to coordinate our schedules to go together! We really weren’t sure what to expect. As kids, we worked out to our Moms’ Sweatin’ to the Oldies on VHS, and will fully admit that those were some fun tapes. 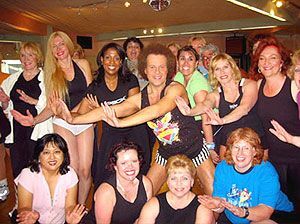 But going to the studio and taking a class from Richard Simmons himself…what would that be like?? We were both shocked to see such an eclectic group of people, both men and women, and the age range was probably from early 20’s to 80+. Richard walked into the class and everyone was just mesmerized, as well as insanely excited to see him. He walked around the room, welcoming some of his students with a hug or a squeeze, sometimes stopping to chat for a minute or two. We figured those must be his class regulars until he approached US, commented on our outfits, and gave us cheek kisses! WOW. What a way to start a workout! 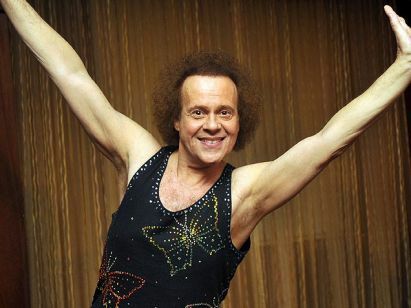 Richard Simmons is one impressive man. He is a little nutty, but has more energy than anyone we have ever met. It’s hard to even put the class into words…all we can say is, it’s something you’ve just got to try once. We’d even venture to say that you can’t call yourself a true Angeleno until you take advantage of working out with this fitness guru! Simmons is full of inspiring and outrageous comments and moves, all of which keep you on YOUR toes throughout the class, sweating and laughing the entire time. Our class lasted a full 75 minutes and we didn’t stop moving for a full hour of that time. The end of class featured a quick weights session with ab work and finally, a mini motivational speech from Richard. It was clear during that speech that he has inspired so many people, as he took the time to introduce the class to a young 18 year old woman who had lost 100 pounds over the past 2 years by taking his classes…it was truly a moving tribute. We can’t say enough about Simmons and his class. He is one-of-a-kind and we look forward to sweating with him in the future!